Pre-hospital care plays an increasingly important part in contemporary healthcare delivery and the skills of paramedics, emergency medical technicians and emergency care assistants are a vital part of this. This casebook supports readers to develop the necessary assessment and decision-making skills they need in order to effectively manage a variety of cases typically seen in UK paramedic practice… . 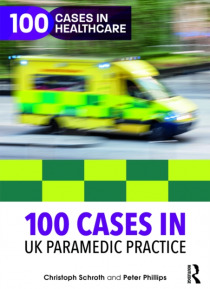 100 Cases in UK Paramedic Practice allows for learning and revision through 100 scenarios which aim to encompass cases that may be seen in daily practice. The book covers scenarios that can occur at any moment of the day, from an ambulance shift to primary care settings to event standby duties. The bite-size structure of this book allows the reader to focus on body systems or random case scenarios, depending on their preference.This is an essential, evidence-based guide for students of pre-hospital care and a useful reference for qualified staff as a source of continued professional development or as a revision tool.